Spacious furnished two bedroom apartment in the prestigious Danesfort development off the Malone Road. Recently redecorated throughout, and is excellent condition. The property offers bright and modern accommodation, finished to a high standard throughout. There is large lounge, open to dining area, and a separate luxury kitchen. The master bedroom has ensuite shower room, there is a good sized second bedroom, and main bathroom.Viewing is highly recommended to fully appreciate this apartment. Available mid-February 2018, rent includes rates. 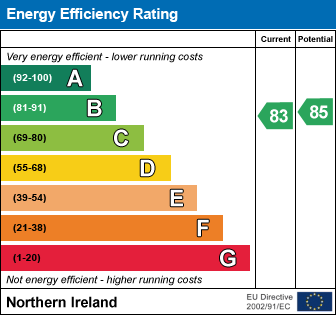 EPC: Current rating 83. Potential rating 85. Check out the property I found on PropertyPal.com: 51 Danesfort, Malone, Belfast BT9 5QL.